September 10, 2010 - Atlas Air Worldwide Holdings, Inc., a leading global provider of air cargo assets and outsourced aircraft operating solutions, confirmed on Thursday that the U.S. Air Force will be extending its contract with Atlas Air, Inc. for the flight training of Air Force pilots and flight engineers who fly the Boeing VC-25, also known as Air Force One, and the E-4B National Airborne Operations Center through 2011. Air Force One is the official air traffic control call sign of any United States Air Force aircraft carrying the President of the United States. In common parlance the term refers to those Air Force aircraft whose primary mission is to transport the president; however, any U.S. Air Force aircraft may carry the "Air Force One" call sign while the president is on board. Atlas Air has been the incumbent sole source provider of this training to Air Force One crews since 2007 and since 2008 for E-4B pilots and flight engineers. William J. Flynn, President and Chief Executive Officer of Atlas Air Worldwide Holdings, Inc., said, ?We are very pleased to continue to provide training for the Air Force?s 747 aircrews who support our national command authorities, performing flight duties around the globe. Our Atlas Air employees are extremely proud to play a role in this mission-critical effort.? This year, the entire pilot and flight engineer crew force of the Presidential Airlift Group (PAG) and the E-4B National Airborne Operations Center will update and enhance their Boeing 747 skills at Atlas Air?s state-of-the-art facility in Miami, Fla. These dedicated aviators receive the most up-to-date systems and safety training from an experienced and highly qualified cadre of flight instructors. Atlas instructors provide tailored training to crewmembers to help ensure mission success. AAWW is the parent company of Atlas Air, Inc. (Atlas) and Titan Aviation Leasing (Titan), and is the majority shareholder of Polar Air Cargo Worldwide, Inc. (Polar). Through Atlas and Polar, AAWW operates the world?s largest fleet of Boeing 747 freighter aircraft. Atlas, Titan and Polar offer a range of air cargo and aircraft operating solutions that include ACMI aircraft leasing ? in which customers receive a dedicated aircraft, crew, maintenance and insurance on a long-term lease basis; CMI service, for customers that provide their own aircraft; express network and scheduled air cargo service; military charters; commercial cargo charters; and dry leasing of aircraft and engines. The "Air Force One" call sign was created after a 1953 incident involving a flight carrying President Dwight D. Eisenhower entering the same airspace as a commercial airline flight using the same call sign. 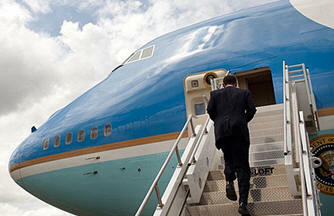 Several aircraft have been used as Air Force One since the creation of the presidential fleet. Since 1990, the presidential fleet has consisted of two Boeing VC-25As specifically configured, highly customized Boeing 747-200B series aircraft. The Air Force is currently looking into replacing the two aircraft used as Air Force One, with Boeing the only contender. The Air Force expects three aircraft, one each delivered in fiscal 2017, 2019 and 2021. Air Force One is a prominent symbol of the American presidency and its power, and the aircraft are among the most famous and most photographed in the world.